Do you see Your Card? There are secrets hidden in our “Your Card” logo. Before reading on can you work out the 3 magic reveals included in the design? 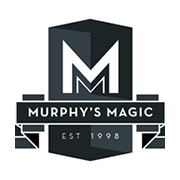 All “Your Card Magic” business cards and any merchandise with the logo printed on it is designed to include these amusing tricks that you can use in your own act! The magician places a folded card on the table as a prediction. The magician has a spectator select a card and forces them to choose the “Ace of Hearts“. The spectator opens the prediction card to reveal the “Your Card” logo. The spectator must agree that the words “Your” and “Card” are there. Then the magician can reveal that their card value and suit is in fact printed within the “A” of the word “Card” in the logo, as demonstrated in the following image. A similar plot to Reveal 1 except this time the “Ten of Spades” is used instead of the “Ace of Hearts“. The reveal location is inside the “Y” and “O” and is demonstrated in the following image. Adjust the patter to suit your style. This entry was posted in Exclusives, Free Tricks, Magic, Originals. Bookmark the permalink. Just $99.00 away from FREE SHIPPING!